Hard of hearing people face two main problems. Firstly, hearing aids are expensive. Take the top six global brands for example: their average price is about $2000, while high-end pieces could cost as much as $5000. Secondly, many conventional hearing aids are not effective enough because they are susceptible to interference from ambient noise. Blue Chen, a hard of hearing person himself, has gathered an AI algorithms team to found RelaJet. He aims to employ “the multi-talker speech separation” to enhance the listening experience for hard of hearing people. 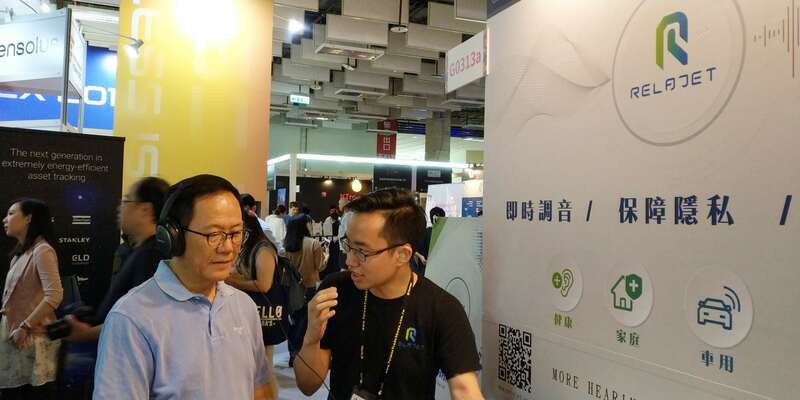 RelaJet, another participating "Taiwan" company, has been focusing on developing software technology that can distinguish different voices when several people are speaking at once. After staying active for some time, RelaJet is able to also recognize and enhance certain sounds. The device can also work as an alert for users who need to be warned if an irregular sound occurs. See you at IFA 2018! It’s a pleasure to be invited by Taiwan Techmakers Association to share what we are doing. This article is written to share some insight about the Panel at Tech in Asia. Let's see our blog! RelaJet 創辦人 Blue 即將在 Tech in asia 演講! Blue Chen – CEO of RelaJet. Blue is currently the CEO of RelaJet, hoping to solve the problems of the hearing-impaired through technology. The company aims to help them communicate, interact and participate fully in life, and also creates its own blockchain for personal health data.